I don't know why I had so many challenges with this card - but it really turned out to be a battle between me, the ink and the Crumb Cake cardstock! I'm still not sure who won! I came really close to giving up but I'm glad I persevered, even if it doesn't look quite as I'd imagined it would. Part of the problem, I think, was that the Crumb Cake card goes quite dark once it's damp, so it was very hard to see my painting until I'd dried it. That's when I discovered that the card seems to absorb a lot of pigment and everything was much too pale. I ended up painting a lot of layers! The base card is in Mossy Meadow, then there's a layer of Basic Black, followed by Cherry Cobbler, Basic Black and then the painted Crumb Cake layer. The black layers are cut so that only a very fine edge shows. The greeting is from the One Big Meaning stamp set, stamped in Basic Black. 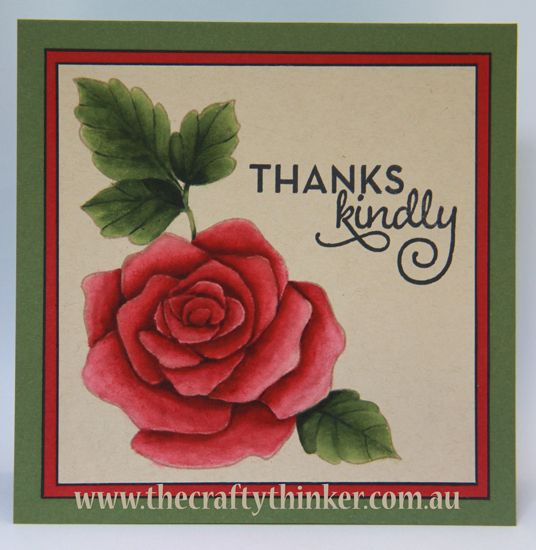 I stamped the flower and leaves with Crumb Cake ink and then watercoloured the flower using an initial base of Blushing Bride and then layers of Rose Red and Cherry Cobbler. I coloured the leaves with Pear Pizzazz and Mossy Meadow. If you would like to make a purchase from my online shop, simply click one of the product images below.